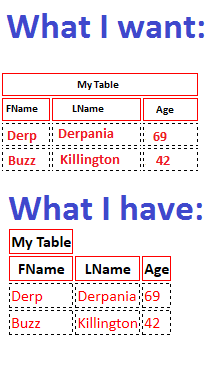 I need to know how to center and span the "MyTable" heading. Can it be down with both HTML (the center tag) and CSS? I tried playing around with text-align, positioning etc but I couldn't get what I want. If there's a solution in both CSS and HTML, please give me both. You have to add colspan to the th element.